I am always happy to find a jewel in a used book store. This 1952 Beacon Press book was the best dollar spent yet this year! In its short 260 pages, Bainton gives excellent comparisons of Lutheran, Reformed, and Anabaptist histories as well as differences in their beliefs. The chapter on Anabaptism (“The Church Withdrawn: Anabaptism”) is a great picture of our struggle for a pure church. I also enjoyed the chapter titled, “Comprehension and the Middle Way of Anglicanism” which explains some history and the unique place the Church of England took between Romanism and Protestantism. 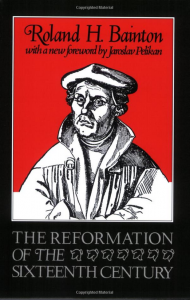 Perhaps the most unique thing about the book is the author’s application of these religious reformers to the political realm (church and state issues) and then to the economic realm (capitalism and Christian vocation).